Rhonda Thurman expresses her concern about paying the superintendent to leave the Hamilton County School system Thursday night during the meeting. Thurman was not the only board member that expressed a concern about the issue. Buckle up, District 1 — Rhonda Thurman came ready to rumble. The incumbent of 12 years is challenged by longtime local educator and politician Dr. Patti Skates and fireman Jason Moses, but on Thursday night she vigorously defended her seat saying she's brawled with politicians for the district as long as she's held the seat. 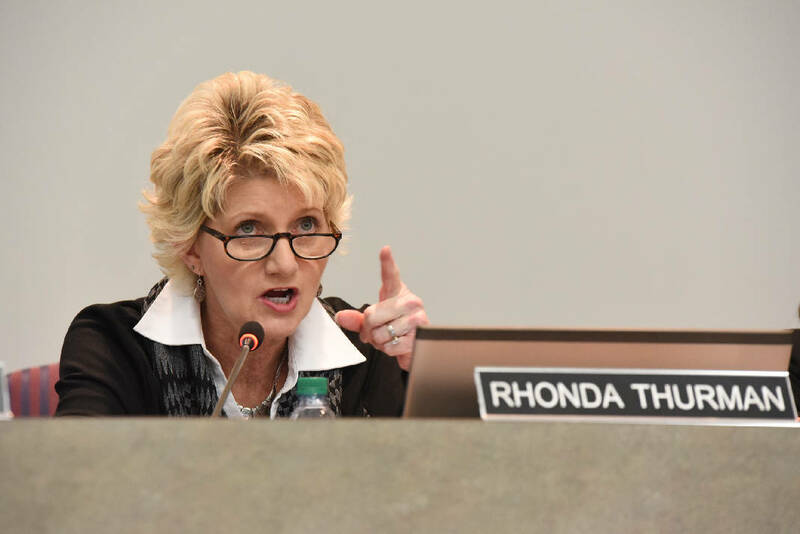 In the third of four school board debates organized by the nonprofit UnifiEd, Thurman said she's dug in her heels on dozens of votes, often alone, refusing to compromise the future of the students she represents. "You can't all sit around and hold hands," she said. "If it requires a fight, I'm ready to fight." That was a firm rejection of Skates' assertion that school board members should be ready and willing to compromise when necessary, not only with one another, but the county commission. She said educators cannot keep returning to the county and ask to increase what is now a $417 million budget without showing some improvements within the system. "We have got to show progress. Once progress is shown, then I think we will be able to get more money," she said. "We have to work together." Moses' speaking time was dwarfed by both Thurman's and Skates', but he did say that he would work closely with teachers and principals to learn how to best structure the budget. "I'd ask a lot of questions," he said. "I'd listen to teachers more and give them what they ask for." The issue of working together is essential now more than ever for Skates, who is frustrated with the state of education in Hamilton County. "When I came in 1988, we were a good school system. When I left in 2010, we were hurting and we're still hurting. Education is not what education was when I first started teaching," she said. Thurman was asked directly by an audience member toward the end of the debate if she accepted any blame for underperformance in the system, but she said there's only so much she can do with her one vote to reject bad policy. "I'm always excited to see a 6-3 vote," she joked. "I'm glad to have some friends." According to Thurman, many of the problems faced by the Hamilton County Department of Education today cannot be addressed because it's impossible to get the five votes necessary to change anything. "They don't want to cut out that position because they would have to say that their friend's job is unimportant."